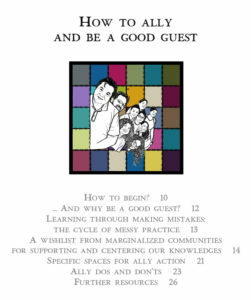 “How to Ally and Be a Good Guest” is the fourth and final part in the “Our Stories, Our Knowledges” Resource Series. This guide shares recommendations for how to be a respectful guest and supportive co-conspirator with marginalized communities. As you will learn, to ally is a verb and not a status. Allyship requires constant work and many trial and error situations. Along with the never-ending cycle of messy practices, we will share a wishlist and some do’s and don’ts when it comes to supporting those with less power and privilege, both online and on the ground.